The Leventina Valley, dominated by the Alps, and the famous Gotthard Pass, is the starting point of this bicycle trip. After only a short ride, you will reach Magadino influenced by the mediterranean climate, while along the way there are countless highlights to be discovered; For example, Bellinzona with its three castles or on the Piazza Grande in Locarno offering many culture and architecture sites. On Lake Maggiore - in German simply "grösster See" or even the Langensee - dive into the charm of the south already during the crossing of the lake! Individual arrival in Airolo. Information on the tour and delivery of the bicycle. Optional bike ride to the Novena pass in the picturesque Bedretto Valley. Airolo at the southern foot of the San Gottardo pass, to the west extends the Bedretto Valley, from where you pass the Novena pass in the nearby Valais or the San Giacomo pass (only path) in the Italian Val Formazza. Through the Leventina Valley along the river Ticino. This journey will take you to the Dazio Grande of Rodi Fiesso. The former Dazio Grande customs house is an impressive ancient building from the mid-sixteenth century, located at the entrance of the Piottino gorge. It was the customs duty of Urner, a horse exchange station and a hostel. In Giornico you will encounter two well-preserved Romanesque bridges and several churches, with more than 1000 years. Through the fertile Magadino plain you can reach Lake Maggiore. Crossing Locarno, a dreamy landscape along the Maggia and Lavizzara rivers to the Centovalli entrance: Intragna. Details: approx. 55 km. Today's "Queen Stage" takes us through beautiful valleys to Cannobio, on the Italian side of Lake Maggiore. Overall, 700 meters of difference in height must be tackled on this phase. Today's stage with its 6000 inhabitants is located directly on Lake Maggiore, on the alluvial terrain of the Cannobino river. Cannobio on the Piemontese shore is the first Italian city on the axis of traffic that connects Northern Europe with the South through the Alpine passes of the San Gotthard and San Bernardino. 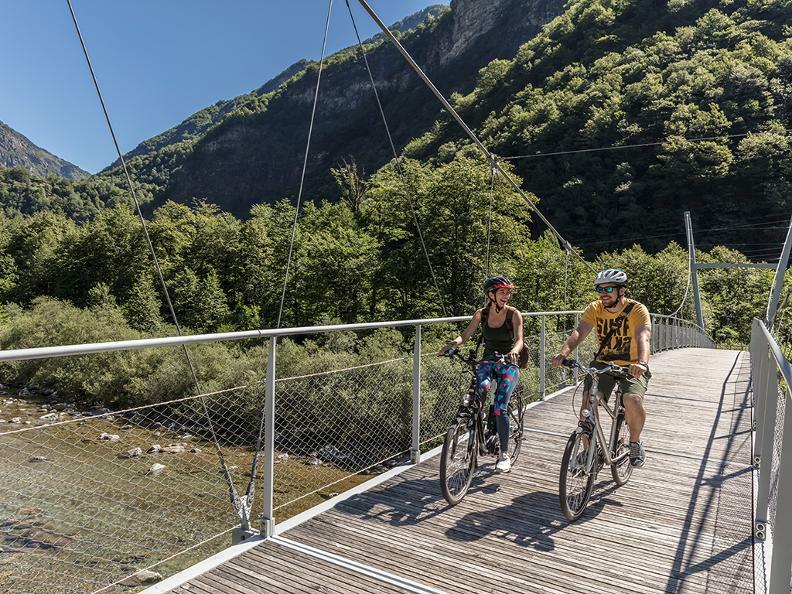 The narrow and winding path - which connects the Vigezzo Valley and the Centovalli - represents a special challenge for cyclists: worth: magnificent views in the depths and wild landscapes. The Italian mediterranean city invites you to enjoy a second night. 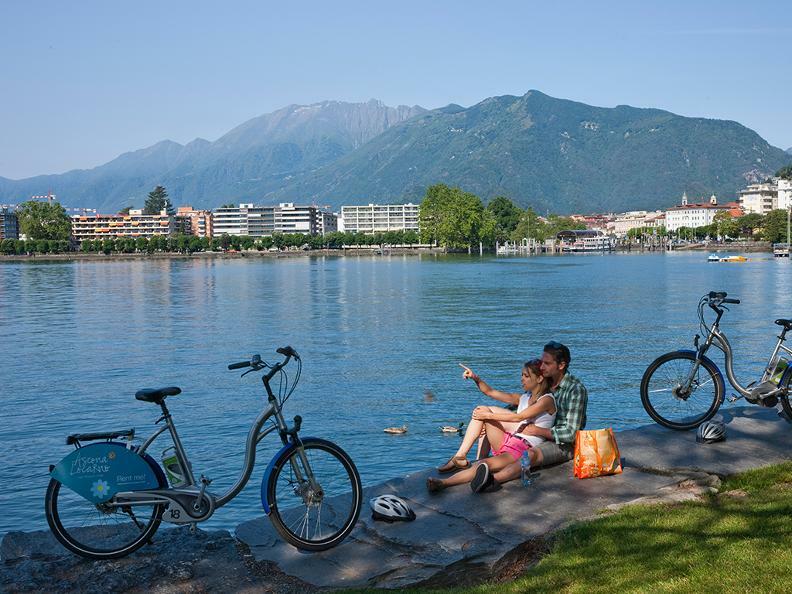 Bike tours in the direction of Brissago - Ascona, Verbania-Intra - to the pretty lake of Mergozzo or to the highest villages of Lake Maggiore. Boat trips to Luino, the islands of Brissago or Ascona and Locarno are organized. Details: approx. 35 - 70 km. In the morning departure by car to the picturesque port of Cannobio - ferry on Lake Maggiore to Maccagno and via San Nazzaro, Riva to the nature reserve "Bolle di Magadino". Passing the Magadino-Locarno airport, we return to the cycle path towards Tenero and Locarno. For early riders: 40 km bike tour in the Maggia Valley. A convenient cycle path has been created along the narrow-gauge railway route. Completion: individual departure, return to Airolo or extension to Locarno.